Just looky here. Look how I have you covered for the weekend! Can you tell how much I’m ALLLLLL about the fall drinks right now? I have had so much fun creating the mocktails and even few cocktails in this season. So I’m trying to decide which cocktail will be the first to make after baby! I’m heavily leaning towards apple cider sangria but I am really feeling these honeycrisp margaritas too. 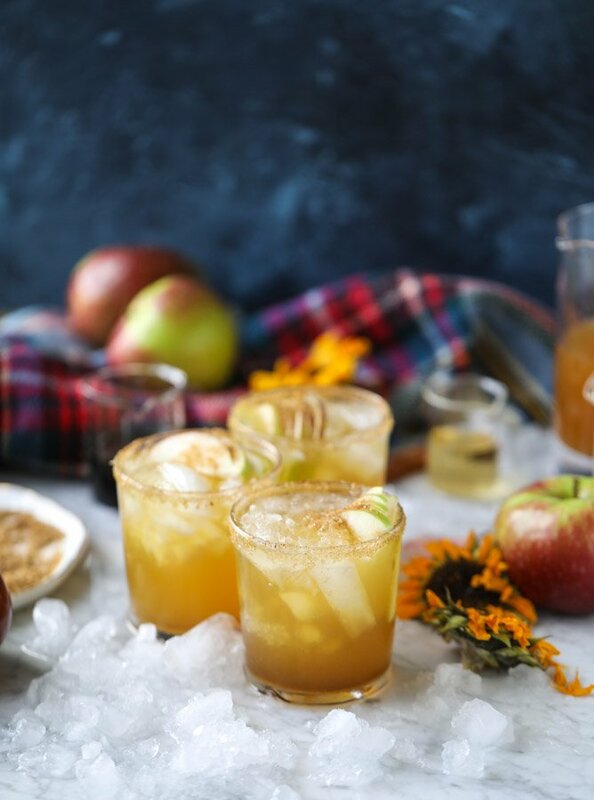 Maple honeycrisp margaritas should be added to every weekend until November – I declare it. When I first was testing out this recipe in early August, I had no idea that we’d be in this crazy heat wave here in PA come late September. But that’s what I love about an apple margarita. It’s sort of warming but at the same time, on the rocks and super refreshing. A total winner if you ask me. 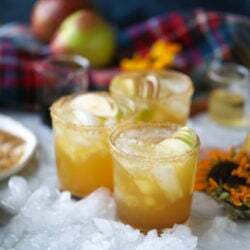 I’ve made apple cider margaritas before but these ones definitely take on another flavor. A bit more warming from the maple and a hint more honeycrisp-y from the syrup. There is a pinch of cardamom in the sugared rim so you most definitely have that whole “what IS that… ” flavor going on. That’s what I love most about them! The honeycrisp syrup. And the maple syrup! Obviously. Broken record… that’s me. The only thing I hate about honeycrisp season is how short it is. They will probably be gone come the end of October which means I will settle for something pomegranate-y or hot chocolate like but uhhhh… not complaining. Since we went apple picking last weekend, I’m now on a mission to make it to all of our favorite pumpkin patches for the remaining weekends of fall. I like us to be as absolutely basic as we can. I mean, if you can’t be wonderfully basic in the autumn months, when even CAN you be basic? There is nothing I love more than making the rounds to the local farms, testing the apple cider donuts, mayyyyybe having some pumpkin or cinnamon ice cream… you know. The usuals. Taking way too many pics of fall spam in the form of leaves and fairytale pumpkins and what not and figuring out if it’s still okay to instagram that junk since people like to unfollow if you instagram one thing that doesn’t fit your theme. I’m very pro-pumpkin on instagram so send me all your pink and green and blue ones! And enjoy this maple honeycrisp margarita on me! Lots of ice please. Fill a cocktail shaker with the tequila, grand marnier, apple cider, simple syrup and ice and shake for 30 to 60 seconds until combined. Fill a glass with crushed ice and honeycrisp slices and pour the margarita over top. Coat the rim of each glass in maple syrup using a spoon or parchment paper. 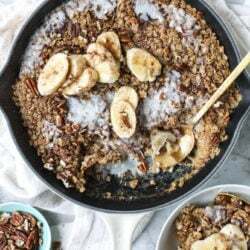 On a plate, stir together the sugar, cardamom and cinnamon. Dip each glass in the sugar to coat. Combine the syrup and water in a saucepan over medium low heat and bring to a simmer, whisking to combine. Turn off the heat and let the mixture cool completely. Store in the fridge in a sealed container. Place the apples and water in a saucepan and heat over medium heat. Cook until the mixture is simmering and the apple is tender and begins to break down. Transfer the mixture to a blender or food processor and puree until smooth and blended. Strain over a fine mesh sieve into a measuring cup. The amount of honeycrisp juice you have is how much sugar you need. If you have 1/2 cup, use 1/2 cup sugar. Equal parts. Place both the honeycrisp juice and the sugar in a saucepan over medium heat. Whisk constantly until the sugar dissolves and the mixture is simmering. Remove from the heat and let cool completely. Store in a sealed container in the fridge. Cheers to being able to wear a scarf this weekend! 1000% making these this weekend!! Oh my goodness!! These look SO amazing! And I totally agree on all accounts – be as basic as possible the moment September hits, and why can’t people be a little less hasty with the unfollow button?! Love your recipes and your words as always! Would you say these are really sweet or is there enough tang? I don’t like super sweet cocktails but LOVE margaritas. 3 words: SIGN. ME. UP. THESE SOUND YUMMY! I would probably to a good squeeze of lime too. YUM! Holy wow, yes please I’ll take six! what a great cocktail idea! good thinking, perfect for this time of year, so thank you! 1. Shoutout to Minnesota and my alma mater (U of MN) for inventing the honeycrip. You’re welcome. 2. That hand. Because of the way the pinky is tucked under the cup, when i look at the picture i only see three fingers and now it looks like a chicken claw. I actually giggle every time I look at it. 4. The bar at your house must be bananas! I think this drink is perfect, especially with the weather being warmer than usual, it is like a transition drink from summer to fall. It’s like it’s tag line should be something like: “the fall drink that will take you from summer to the basic fall girl, who eats, sleeps, drinks, decorates and dresses all fall, haha! This is going to be the drink I make for Friendsgiving this year. Honeycrisp apples are my favorite, and adding tequila will get any party started. I think I should test these out a couple times, just to make sure I get the recipe right before the big party. These are amazing, and I’d like to create them for a dinner party next weekend. I can easily multiply the recipe, but could you explain about how many ounces the maple simple syrup and honeycrisp syrup each make so I know how to multiply those? Thank you for another beautiful recipe!